Learn more about what can you learn about people from Facebook? And about the psychology of Facebook, why Facebook is so addictive? Why we like, comment and share, Why this happening about Facebook? 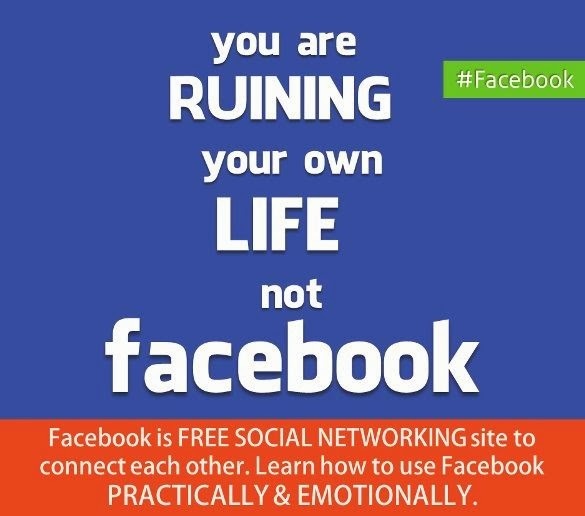 Why people are addicted but still not happy with Facebook? What are the advantages & disadvantages of Facebook? What insecure people post on Facebook? All those FB postings are shameless attention-seeking? Why is Facebook also becoming a part of our life these days? What is this Facebook all about? How is this FACEBOOK affecting our whole attention? And how to be productive on Facebook? Learn how to use Facebook productively and meanwhile, keep a note that, it's not only related for you but for your living life. Theoretically, we all knew the Facebook is a popular free social networking site where users are get registered to create profiles, then they upload pictures and videos, send messages and get joined to keep in touch with each other. It's free to join the network, and by the rule, it requires that you be over 13 years of age with a valid email address. Facebook makes it easy for you to get connected and share all the things you want to, with your friends as well as your family members & your co-workers. The Facebook pages, groups these marketplaces along with latest technology updates like FB messengers allows all the users to post, read, comment, publish, promote and to chat with all your joined members simultaneously. We knew the Facebook is a social network, but socially don't know what is Facebook. We know how to join friends, but there are some users who don't know how to get connected. Facebook gives us a path to make our life more joyful, to get fun, to share our emotions, to post updates, to publish news & there are few users who even don't know how to do all of that. The past investigations have found that the practical use of Facebook is associated with jealousy, internal social tension, isolation, and depression. Theoretically, we know all, but practically & emotionally the Facebook affects our mind & so life, and exactly here we lack behind in using it. Here we are going to learn how to use Facebook practically and with controlled emotions, how the psychology going to change, how and what we can learn about the people from Facebook, why we like, share, comment and chat addictively, what is the psychological motivation behind updating status, sharing photos or videos and how we can be productive while Facebook is changing the social life of our species. What is this Facebook? Why this Facebook? How is this Facebook? The Main issue is, lots of the users are always in their own mood & connections, but only a few of them tries to get the context of words expressed through the status updated by their friends. On the Facebook most of the users pretends like 'he is KING on Facebook'. And I agree with that. But that doesn't mean you are going to ignore your neighboring KINGDOM that is of your friend. Some users have a tendency that they give LIKES only & only when the status updated by friend touches their own emotions & their life-situations, but not admired it since it actually expresses lots of to the meaning & feelings relate to his friend. You need to know the Status is not for you nor to match with you, rather that's the feeling of the updater. Some of you are just there only to watch 'what's going on' on others profile, but never try to go & communicate. Remember you are here on Facebook for interaction & not in the theater for WATCHING DRAMAS. You are a friend and not a FAN! Remember; INTERACTION is very important than sending a friend request. If you are on FB for adding friends only then you either messing up with yourself or you don't know how to grow up. Some of you logged into the Facebook, just to update statuses for reporting either the updates like "I'm at MacD", "traveling to blah blah blah...", or updates from FOOTBALL news or weather conditions, but they failed to give attention to the mental condition of their friends, and they never try to come out of their own box. You using FB from a long time, till now you have joined all kinds of friends, but some of you are there to communicate only & only with the SAME context of groups. They forget all of the friends also need your equal attention. Everybody wants lots of LIKES/COMMENTS on what they share, but most of them FAILED to give a simple try to see what's happening on a friend's life... Liking and Commenting remains later part. They are there to give comments only when someone suddenly updated something WRONG, but they never try to appreciate when someone posts good things. Most of them are very good at arguing with the topic. I would like to tell them since every topic has a positive and negative side, so it doesn't mean to make a comment to argue. Try to catch the theme currently going on that topic. Note that, arguing is also important, but UNDERSTANDING is more important than that. LIKEing doesn't mean "I love you" or "I like you" — It’s just giving respect to the words written in status. Please keep your own values & ego aside and try to pay more attention & keep APPRECIATING & LIKING. Why you don't understand this simple way to get better connected? Don't be a kid to SHARE Internet kinds of stuff like poems, photos & all, we all know how to use GOOGLE. If you can't update or share your feelings or don't know what actually going on your mind, probably you are under 13 and need to grow up, then just shut-down all and seat back to focus your homework. If you are getting angry by reading these issues monopoly or you are going to ignore this, then you are nothing less than a stubborn, egoistic Moreover you are the person who really deserves to HATE. I'M requesting you, please DELETE yourself from Facebook and all friend's lists or just let your friend so they will do it for you. If you belong to this narrow mentality people category, please check the SOLUTIONS below. Really! The thing is that, not only you messing up with your friends but also yourself by wasting your OWN valuable time. We don't want a certain number of friends; we just want a few friends to be certain of. Don't panic if you got deleted from any of your friends, but panic yourself because you give them a reason. Don't see who AM I here to tell you? Please see what actually I'm telling you, it’s IMPORTANT. If you feel all these insignificant and impractical, please don't take the effort to tell me that. You are happy in your own way; then me too in my way. Move the face forward & just excuse us. Also don't tell that you are busy and don’t have time for the Facebook and all this, if it so, then, WHY you opened your account on FB??? Facebook also has its own values and rules to follow. And YES we all take this Facebook seriously, please don't give any damn. Only big-hearted people will understand the above issues and will try to follow. Not just words but try to read the actual mean of the status. If you feel it's nice then don't forget to APPRECIATE it by the LIKE. Don't ignore updates of your friend. Always read carefully according to the point of updater. Everybody wants to be happy, so try to spread happiness, and off-course one day we'll all also seems happy, trust me. Give lots of LIKEs even on every comment you get on your post, only just because they are there to give respond by his words but the most important is, you have BIG HEART. I know Facebook is not A LIFE, but don't forget when most of the time, your friends get known your problems which normally you had felt to express, then they give LIKE, Comments only just to make you relief to face your problems. Only APPRECIATION has the power to motivate for making the GOOD CHANGE in any person. Remember how it feels when someone appreciate your efforts for little things you did, so APPRECIATE EVERYTHING, EVERYONE! We think at least by following these issues we can make other's as well as our life more satisfactory. Let me know what you think about all this paper if you have any suggestions to include, you can share it via comments; I will glad to add it on this page directly.